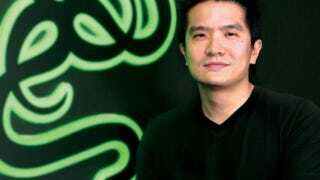 Peripheral (and recently PC) maker Razer's CEO, Min-Liang Tan, is passionate about gaming. So are we, but we don't have $10,000 to donate to the Wasteland 2 Kickstarter project. He does, and he did. Razer PR pointed me towards a post on Min-Liang Tan's personal Facebook page, where he talked about becoming one of five people so far to pledge $10,000 or more to Brian Fargo's Wasteland 2 Kickstarter. His $10,000 pledge earns him a ton of Wasteland 2 swag, including an in-game shrine dedicated to him and 50 digital copies of the game itself, which he plans to share with the Razer community. Perhaps the shrine will be inspired by a combat knife. That's of course assuming the project makes it to its $900,000 goal. With nearly $700,000 pledged already and 33 days to go, I'd say chances are pretty good.